If you didn’t think the “selfie museum” craze could get any more ridiculous, just wait until Deadpool gets his [baby] hands on one of his very own! 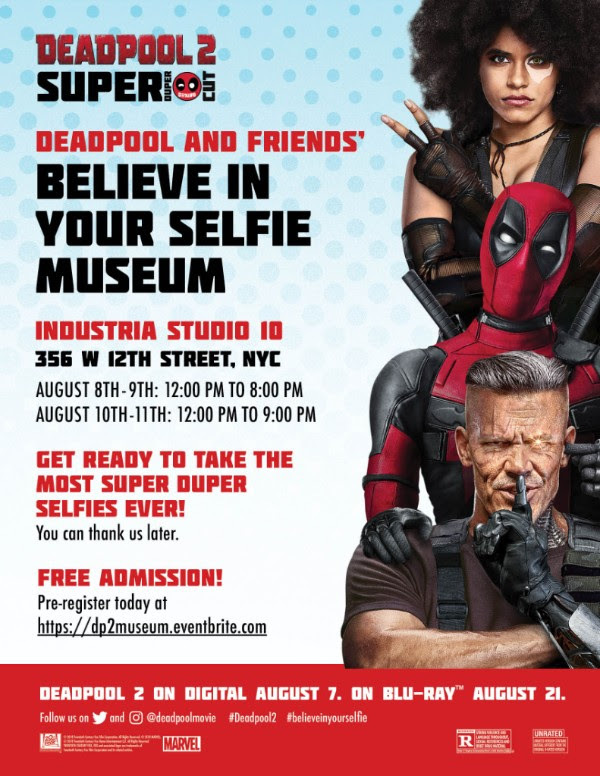 Deadpool and Friends’ Believe in Your Selfie Museum, a limited run photo opp pop-up, makes the ultimate superhero landing in New York City’s West Village just in time to help fans celebrate the home entertainment release of the Deadpool 2 Super Duper $@%!#& Cut, on Digital August 7 and Blu-ray August 21. This museum may not have 29 rooms, but it’s not all about size, ok? Nine distinct photo opps give fans the chance to take outrageous selfies recalling some of the Merc with a Mouth’s favorite things—from unicorns and rainbows to his most beloved X-Force members. Dive into Colossus’s big, shiny foam pit and even see what you would look like with a pair of freakishly small toddler legs! There will be a standby line on-site, though admission is not guaranteed. Standby guests will be accommodated on a first come first serve basis as space allows.